Hello, our name is Annette and Larry Garris and we’re currently the owners of Garris Jewelers, LLC . We have been a family owned, independent Jewelry Store since 1904. 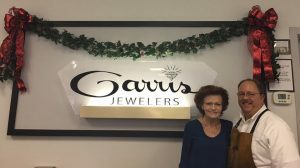 It has been Garris Jewelers since 1980. We pride ourselves on honesty, quality jewelry, great values, and making the jewelry buying experience fun and exciting. We are a full service jewelry store and can accommodate all your jewelry needs. We value our relationships with our customer and manufacturers. We have been a member of the Independent Jewelers Organization (IJO), the largest jewelry buying group in the world, since October, 1986. Our membership in this prestigious organization allows us to buy unique pieces of jewelry at great prices. Also, by being a member of IJO, we are the only jewelers in Lancaster County that can purchase a select group of unique jewelry for our most discriminating customers. Please stop by and let us show you how we can make your occasion unforgettable.